I traveled about 28 miles today. 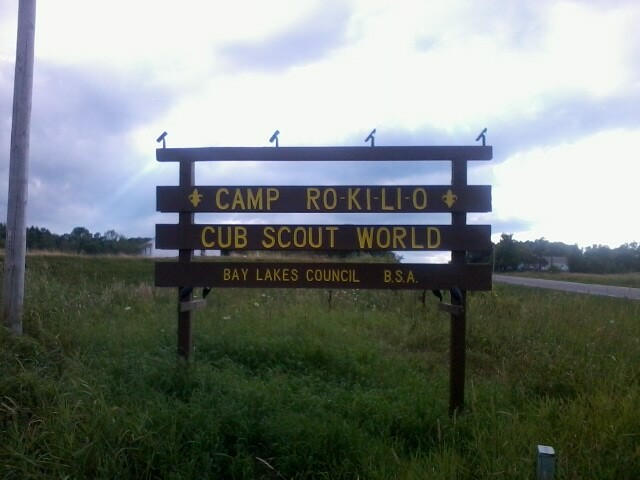 Camp Rokilio Rox! We hiked here from Manitowoc today on almost all roadwalking. The hike wasn't too exciting but the destination is great! We arrived just at dinner and the staff was very welcoming. They are just starting their last session of Cub World for all cub scouts so the staff should be pretty tired - but you couldn't tell. We've been given a cabin in which to stay and a scout staffer is driving us back to the trail early tomorrow. Oh, dinner was great too! After dinner, I was asked to talk to the cubs and I just let them ask me questions for about 5 minutes. It was fun and there were still more hands up when we finished.